Parishioners begin raising the $93,047.40 it will take to build the parish’s first church. They hold chicken dinners, raffles, rummage sales, dances and pledge drives. The Albert Riedy family donates six lots for the new building. On August 29, the cornerstone is laid with hundreds of clergy, parishioners and friends attending. 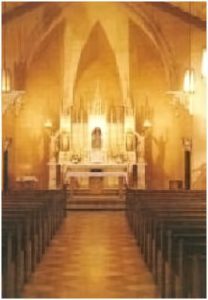 On June 25, the original St. Joan of Arc Catholic Church opens. The first Mass is the Joseph Miller – Bertha Long wedding. 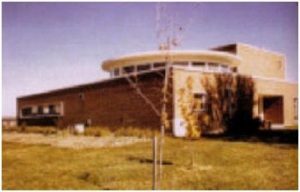 The building includes a three-room school, a church seating 500 and a convent. In the fall, the parish grade school opens. Classes are led by two Benedictine Sisters from Sacred Heart Monastery – Sister Mary Dolores Janota and Sister Mary Clarissa Ruda. The next year, Sister Mary Bonaventure Kovalcik arrives. On June 17, three girls and two boys are the first graduating class from St. Joan of Arc school. The second graduating class would have 12 students. On November 24, St. Joan of Arc’s building is dedicated. The Reverend B.J. Sheil, auxiliary bishop of Chicago, officiates. 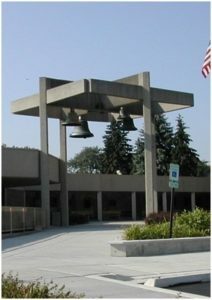 The Diocese of Joliet is created and includes St. Joan of Arc Parish. 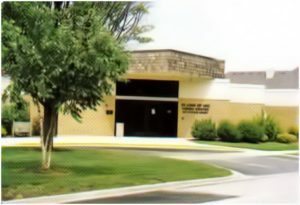 In the summer, construction begins on the elementary school. The new school building on Columbia Avenue opens with 320 pupils. The junior high addition is constructed. 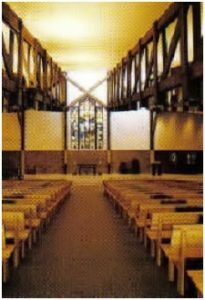 The addition includes a large gymnasium, the basement of which also serves as the Parish’s Chapel, where additional Sunday Masses are eventually held, since the original church building can no longer accommodate the larger congregation. 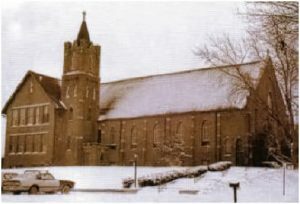 On February 19, the parish holds a farewell Mass in its original red brick building. The building is razed in August after it is condemned for being structurally unsound. The same year, the parish begins a $1 million fund-raising drive to build a new church. On July 25, ground is broken for the new church. On Christmas Eve, the parish celebrates its first Mass in the new church. On March 13, the church is officially dedicated. In the spring, the Benedictine Sisters return to live at Sacred Heart Monastery, and the convent is converted into parish administrative offices. The rectory is relocated to a house on Front Street, and the former rectory building is sold. This year also sees the completion of an addition linking the elementary and junior high buildings, as well as the addition of more classrooms and offices. St.Joan of Arc School wins the Elementary school Recognition Award received by only 34 outstanding Catholic Elementary Exemplary Schools in the nation. In September, the parish launches a fund-raising drive to build a parish center housing adult religious education classes and other programs. The first kindergarten classes are held in the school. 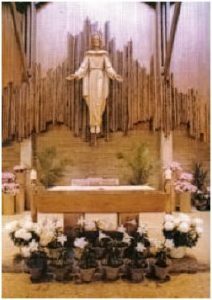 St. Joan of Arc Parish celebrates its 75th anniversary. The new parish center is dedicated on June 13. Preschool program for three and four year old students opens. US Department of Education recognizes SJA as a National Blue Ribbon School. The PAR is renovated to create a updated multipurpose area for school and parish activities. St. Joan of Arc students communicate directly with NASA’s International Space Station. Lunch for students takes place in the PAR as opposed to individual classrooms.